From Couch to Ironwoman: Would You Do Things Over? Would You Do Things Over? I am still on vacation (yes I haven't worked since December 23rd, I'm pretty sure when I go back I won't remember what sign language is), so I have had a lot of time on my hands lately. Unfortunately, now that the holidays are way, way over everyone I know is back to work. I was pretty bored today and other than taking the Bern for a walk through a new to us park on some trails, I was watching hip hop dance videos and listening to old high school/early college days' songs. All. Day. Long. That got me thinking about my high school days and how, for the most part, they were pretty fun. 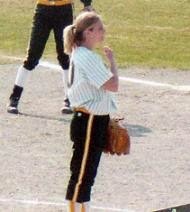 Why yes, I was blonde back then! But would I do them over if I was given the chance? I'm not sure about that. I think that I accomplished and experienced everything that I needed to in order to get to where I am, and to be who I am, today. In high school I was not popular but I wasn't unpopular either. I guess I was a middle of the pack kind of person, kind of how I am with triathlon. I played sports, less as the years went on, (I ran cross country one year and then the 3 miles wasn't fun for me, that's funny now, and I played softball for two years but a line drive to the face stopped that) and I loved swimming. 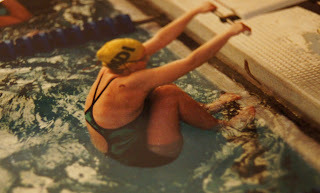 Swimming was my life. Kind of like how triathlon is my life now. I can think back to certain moments in my life and swimming was usually there with me. I never really dated anyone seriously, because I would get bored and always tell them that I had to focus on swimming, I had to miss out on some of the fun things that my friends were doing because I practiced 8 times a week, which included a Saturday morning practice. But I still managed to have all the fun times at dances, friends' houses, riding loops around town and, yes, listening to my rap music. But, those days are over and so are my college days. Cool!I love that you were so into swimming then. Well if you went to a different High School, we would have never have ran cross country together and then I would never have met you or Mike or all the other awesome running friends I now know. So I guess high school was worth it! Basically what Isaac is saying is that if it weren't for you....then he wouldn't have met me. hahahahaha! Fun to think about. Are you ready to get back to the routine? Yep! Chipped two of my teeth :) If I had continued to play I would have worn a mouth guard, but I'm still frightened of getting hit in the face again. I was a dork, constantly picked on and teased. I hated the kids in my school and had few friend. However, I still don't think I would do anything over because it made me who I am now. I love that you were involved in sports, I didn't start until much later in life, but wonder how things would be different if I started earlier. I am jealous you have off for so long! ;) You were really cute as a blonde!